Hoshin Kanri is a Japanese term which refers to a specific objective for managing change, direction, policy, etc. There are 6 Hoshin Kanri Steps that you need to be aware of, but we will get to those in a minute. First, we need a clear view of how KPI Fire ties in to all of this. 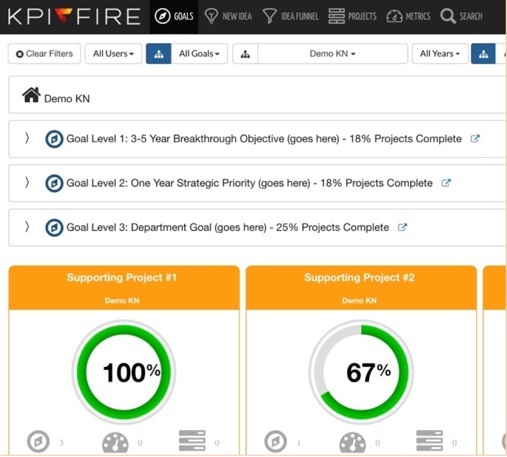 KPI Fire is the #1 project management and strategy execution software that will guide you through the successful execution of your strategic plan step by step. Hoshin Planning focuses on cascading long term objectives down to short term objectives and then continues to break the strategy into smaller components throughout the organization. The KPI Fire team is full of Hoshin Experts. We will personally help you define your highest level goals and create a peronalized Hoshin Kanri strategy. Continue reading and see why you need us to help youYou will be able to execute those goals faster so you can begin to see meaningful, tangible succes. Hoshin Kanri – Step 1: Clarify your current state and identify your Mission, Vision, and Values. To start your Hoshin Planning, you need to begin thinking long term. What does success look like in 5, 15, 30 years? Your company’s Vision and Mission statements are a good place to start if they have been well written and are still relevant. Mission: Why do we exist as an organization? (or) How is the world a better place because of us? Values: What are the non-negotiable core values that we will not violate to achieve our goals. Now begins the magic of Hoshin Kanri! We begin taking this long term view and breaking it down into smaller bite size pieces. We start with our Mission Statement. Clarifying the purpose and desired future state of your organization is an ideal place to begin developing your strategy. The breakthrough objectives are mission critical objectives. These objectives may take 3-5 years to fully accomplish and are likely the cornerstone of your long term strategy. Once identified these objectives can be referred to as your “Hoshins”. In 3 years from now, if we look back on what we have accomplished from now till then, what is the biggest, most significant accomplishment we could achieve? What is the single most important objective we need to accomplish to remain competitive 3-5 years from now. The Hoshins, or Breakthrough Objectives, should then be broken down into Annual Objectives. These annual objectives are the basis for your departmental and even individual annual strategic plans. Get specific here. Don’t settle for generic statements like “grow”. These annual objectives should be stated as goals. Keep your list of Annual Objectives reasonably small. If you make a list of 10 or more items, it is unlikely that you will get them done. If you keep your list short (1-3), you will have a much better chance of accomplishing them. Here are a few terms used in KPI Fire to refer to specific parts of the objectives. Goal: A broad or specific statement of intent. Defines “what” we want to accomplish. A good goal format is: From X to Y by When. Metric: How will you measure your intent. A metric is something that can be measured. What are the Key Performance Indicators? Determining which Key Performance Indicators (KPIs) you will use to measure the success of your business is critical to successful Hoshin Kanri. Remember that there are different types of KPIs (or metrics), leading and lagging indicators, measures of performance and measures of activity. KPIs should be cascaded throughout each department and layer of the organization. Note: Historically companies would use a Hoshin Kanri X Matrix for Step 2 and 3. The X Matrix is basically a spreadsheet that connects your company’s strategic objectives to KPIs; and then in a downward spiral to the objectives of each department throughout the organization. You’ll feel like you need a good chiropractor if you try to use the X Matrix to manage your strategy on a daily basis. KPI Fire replaces the X Matrix with an easy to use visual too;l where projects, metrics, and goals can be tracked together in real time and team members can collaborate to achieve their goals. Identify Strategic Projects. Projects are the incremental units of work that move you toward your objectives. Projects may be cross-department but are usually executed within a single department. Improvement Projects are the type of work that can make far reaching impact on your overall trajectory toward your goals. Improvement Projects are usually outside the scope of your day-to-day work and are often important but not urgent. For this reason these are the kinds of things that can get pushed off and deferred unless you have a dedicated system for tracking them and moving them forward. If the first few steps were easy, then this is where the real work begins. The rituals for execution include developing a regular cadence of rituals designed to help keep things on track. Should be conducted between the members of the teams at each level. For each Red or Yellow item the team should identify possible corrective actions to get the overall goal back on track. This corrective action may take the form of a new project that needs to be initiated. Each project should be assigned to a Project Leader. The Project Leader should perform regular reviews of the report and provide reports to the stakeholders at agreed upon intervals. We recommend that Project Leaders are reviewing each project at least weekly. Why choose KPI Fire as your Hoshin Kanri Strategic Planning partner? That means we make it happen; plain and simple. We make it easy to understand and implement. We guide you through every step of the process; and we really do care about your success. You can contact us any time, we are here to support you; not only with the technical side of using the software, but we are here to teach you about Hoshin Kanri, Hoshin Planning, Strategy Execution, and more. We want to teach you what we know. We want to help you reach all of your goals; all you have to do is let us. Hoshin Kanri WILL help your business! For answers to your questions or to get started with your own Hoshin Plan, send us an email at hoshin@kpifire.com. You call now to speak with one of our team members:+1(855)9-KPI-FIRE, +1(855)957-4347. Our team is ready to help you have the best year yet! KPI Fire is an easy to use cloud based software that makes Hoshin planning simple and easy. As a critical Lean tool, Hoshin Kanri enables you to cascade company goals throughout your organization. KPI Fire makes visualizing the Hoshin plan intuitive even for someone performing Hoshin Kanri for the first time to use. KPI Fire was built to align executives, middle management, and team members around shared goals in the Hoshin plan. Assigning goals is fast and intuitive. Once established leaders can easily see how they are progressing toward their strategic objectives and where they need to make improvements. On the other hand team members and operators can track process performance measure in real time. This enables them to make adjustments on the fly and submit improvement ideas to their team’s Idea Funnel in KPI Fire. Manufacturing, healthcare, and service industries alike have chosen KPI Fire as their all-in-one strategy deployment software solution for one reason, it will have a positive impact on your business. KPI Fire is the only software designed to take your strategy from concept to execution and focus your team like never before. If you are in the market for a Hoshin Kanri or Strategic Planning software solution take a closer look at KPI Fire. We can setup a quick demo for your team and get you up and running in just a few minutes.